When they came to Firebelly in search of elevated web design, SCB had a lot to talk about. A forward-thinking architecture and interiors firm with an 85-year history, SCB had completed hundreds of projects across the country and around the globe. The firm had a lot of compelling stories to tell, but didn’t quite know how to tell them. And in an industry famous for being old school, SCB struggled to strike the right balance between their progressive spirit and storied legacy. After a brand audit in 2014, the firm decided to keep their logo, but realized they needed a new website to showcase who they really were. That's where Firebelly came in. We refined and translated SCB's existing brand to the web, emphasizing approachability while maintaining an enlightened design sensibility. 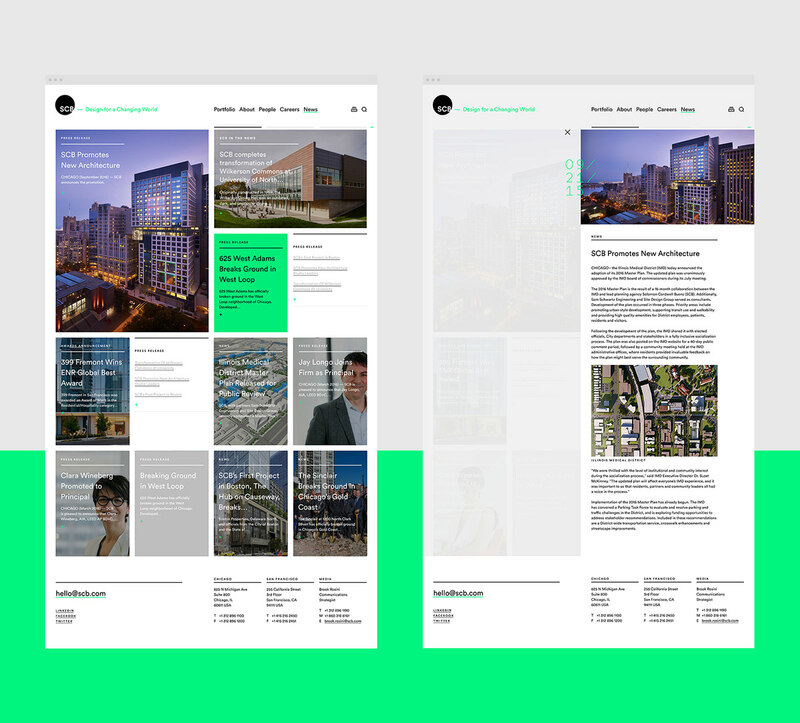 We developed an intuitive content hierarchy, using type and color to distinguish different kinds of content and highlight important information—smart, yet subtle details that also worked to convey the firm’s thoughtful approach. 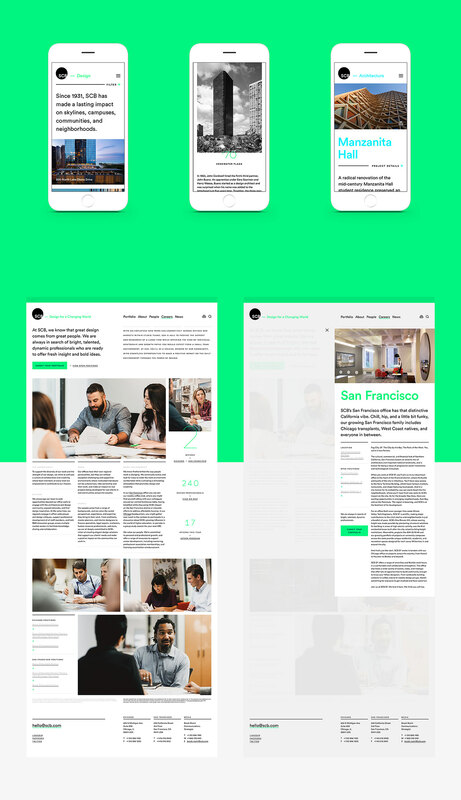 Given the extensive volume of current and legacy content, the site required a powerful back-end, constructed to ensure a simple, user-friendly experience. 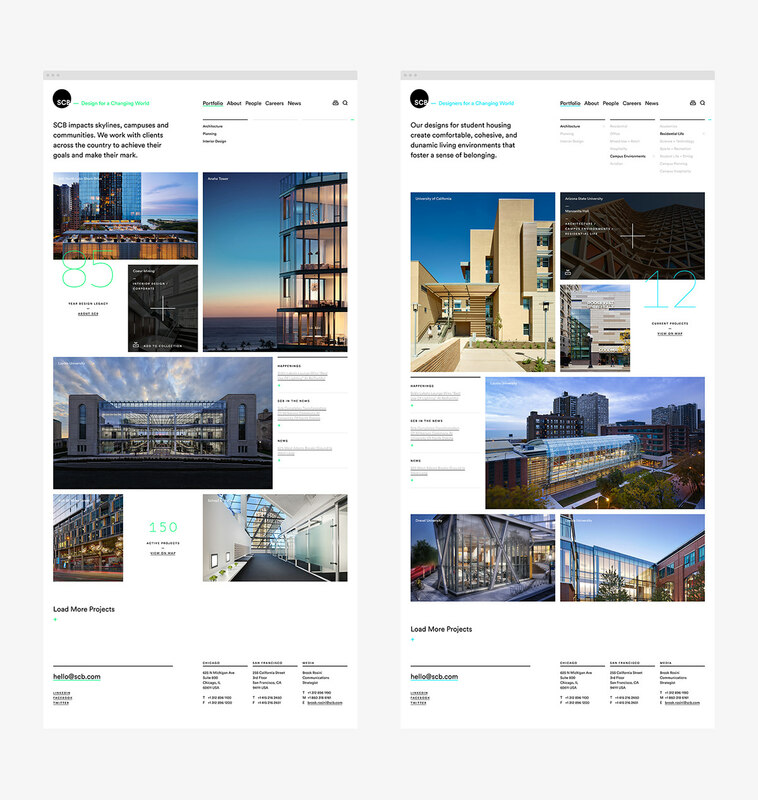 The site’s information architecture and navigation facilitate a seamlessly-layered visitor journey. Interactive features include projects and team bios that slide in as overlays onto site pages and the option to add projects to a shopping-cart style collection that can be emailed, saved or printed as a PDF. 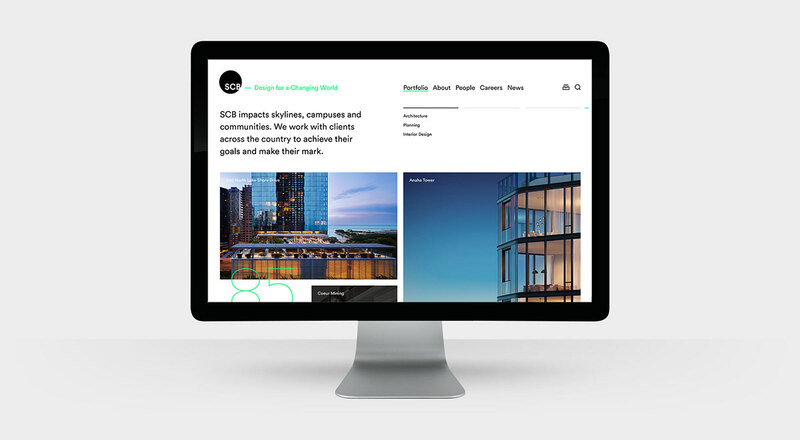 No other architecture firm's site has functionality quite like it, and its beauty is twofold: it makes it easy for clients and potential partners to find, share and reference projects they like, and it eases the production burden on SCB's marketing and business development staff. And of course, the site scales to suit any device, maintaining legibility and ease of use across screens. When they came to Firebelly in search of elevated web design, SCB had a lot to talk about. A forward-thinking architecture and interiors firm with an 85-year history, SCB had completed hundreds of projects across the country and around the globe. The firm had a lot of compelling stories to tell, but didn’t quite know how to tell them. And in an industry famous for being old school, SCB struggled to strike the right balance between their progressive spirit and storied legacy. After a brand audit in 2014, the firm decided to keep their logo, but realized they needed a new website to showcase who they really were. That's where Firebelly came in.